Over the past several years, Dwayne “The Rock” Johnson has proven himself to a very “bankable” star in Hollywood. With a failed prospect of playing for the Calgary Stampeders in the Canadian Football League back in 1995, Johnson joined the ranks of the WWE (World Wrestling Entertainment) and became a professional wrestler. His fame skyrocketed during his tenure with the organization (from 1996 to 2004), winning over 17 championships reigns. While he was featured in several movie during that particular timeframe, Johnson began to increase in popularity (in Hollywood) sometime after he left pro-wrestling, starring motion pictures that would befit his deliver timing of dialogue and charismatic bravado. While he started to appeared in smaller feature film roles, it was until 2011 when Fast Five (the fifth installment in the Fast and the Furious franchise) came out and he became a much more recognizable and “bankable” lead male actor. Since then, Johnson has become a Greek god in Hercules, a legendary shapeshifting demigod in Disney’s Moana, a steadfast lifeguard of Emerald Bay in Baywatch, a CIA agent in Central Intelligence, a video game avatar in Jumanji: Welcome to the Jungle, and has even battle giant monsters in Rampage. Now, Johnson returns to the big screen (for his second 2018 release) as Universal Pictures (and Legendary Pictures) and director Rawson Marshall Thurber present the film Skyscraper. Does Johnson’s charismatic acting talents propel this action-based feature or does it falter underneath its cliché storytelling of larger-than-life heroism? Ten years ago, Will Sawyer (Dwayne Johnson), an army veteran and FBI Hostage Rescue Team Leader, lead his team on a rescue mission, but things go sideways and severely injure him. The resulting injury leads Will to have one leg amputated and (through a chance encounter) meets his future wife, Sarah (Neve Campbell), while in the hospital. In the present, Will, Sarah, and their two children Henry (Noah Cottrell) and Georgia (McKenna Roberts) are visiting Hong Kong and staying at The Pearl, a technical marvel and the tallest skyscraper in the world and design by visionary creator Zhao Long Ji (Chin Han). Recommended by his close friend and former FBI Hostage Rescue teammate Ben (Pablo Schreiber), Will is hired by Zhao to conduct a safety assessment of The Pearl, before it opens up its residential levels to the public. However, while conducting a part of his assessment of The Pearl (in an off-site location), something goes wrong within the towering skyscraper. A terrorist group, led by mercenary leader, Kores Botha (Roland Møller), has infiltrated The Pearl and set the several floors on fire and gaining control of the advance security measures of the skyscraper in the process. To make matters worse, Will’s family is still in The Pearl, and only a few floors above the danger when it begins as well as Zhao himself, who seems to be the main objective of Botha’s plan. Now, evading Hong Kong Police and scaling the massive structure, Will must contend with a number of obstacles as he makes his way up The Pearl to save his family, rescue Zhao, and stop Botha’s mission. Echoing to what I said above, Dwayne Johnson has really done it all (and then some). Like many out there, I first knew him as a WWE wrestler, but I really didn’t follow the sport that much (merely known him by name and how he looks like). I remember seeing him in several movies (before he became a popular star in Hollywood) like when he was in The Scorpion King, Be Cool, The Game Plan, Get Smart, and Planet 51. However, it was until he joined the Fast and the Furious franchise for 2011’s Fast Five is when I really began to take notice of Johnson and he likeable personality (and I think so did the general public as well). 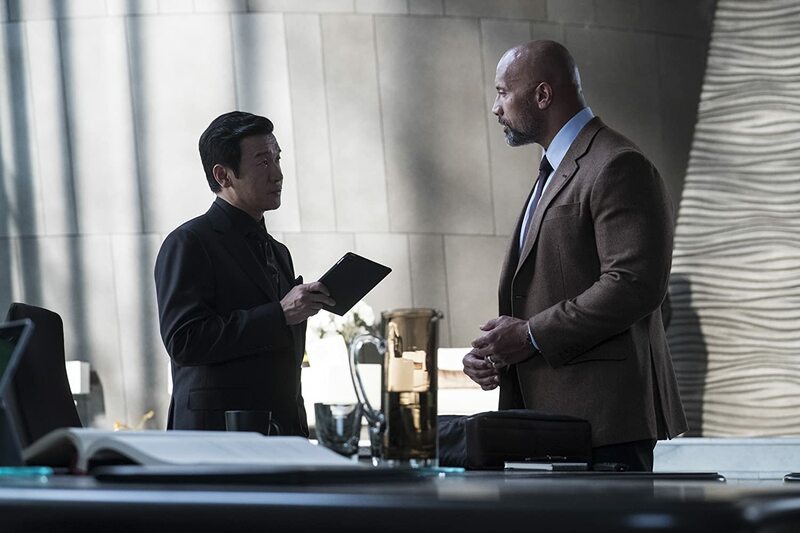 Of course, I liked him in the Fast and the Furious movies, which did help him gain credibility in Hollywood, as Johnson went onto become more of prominent star in other feature film endeavors like San Andreas, Central Intelligence, Moana, Jumanji: Welcome to the Jungle and (most recently) in Rampage. While some of his movies have been “hit or miss”, Johnson’s performance is usually highly praised and usually carries the feature on his charm and screen-presence. Love him or hate him, Johnson has become a big-name star in current Hollywood; gaining likeability with each movie he does and doesn’t seem to be stopping anytime soon. Skyscraper is the latest endeavor that has Dwayne Johnson headlining a big blockbuster feature film. I vaguely remembering hearing that Johnson was gonna be in another big action blockbuster-ish movie in 2018. To be honest, after watching him in Rampage, I kind of figured it was gonna be the same thing (just more action heroics than giant monsters) and that meant that Skyscraper was gonna be an “mediocre” or “meh” movie with Johnson charm / screen presence carrying the brunt of the feature. Similarly, the movie trailer for Skyscraper did little too excite me as well. Sure, the editing of the trailer the movie look halfway decent and entertaining, but I just had a feeling (in my gut) that the film was gonna be a cliched throwback 90s action flick, with none of the entertainment value. Still, given how much I like Johnson (as an actor) and given the fact I was slightly curious to see it (even just for the sake of reviewing it), I went to Skyscraper with…. what’s the saying “hoping for the best, but expecting the worst” mentality. So…. what did I think of it? Well (to be honest), Skyscraper was a pretty tamed and “by-the-book” feature film. Johnson’s presence is felt in the movie and the film itself has all the right components for a large-scaled action movie, but is too derivate of the genre to even discern itself from what other films have done (and done better). Skyscraper is directed by Rawson Marshall Thurber, whose previous directorial works include one of Johnson’s previous films (i.e. Central Intelligence) as well as other comedic movies like We’re the Millers, Dodgeball: A True Underdog Story, and Easy A. Given his attraction to gravitating towards more comedy-based endeavors, Thurber makes Skyscraper his sort of first mark into the action genre. To his credit (and despite the film’s many flaws), Thurber still makes the film decent enough to be semi-entertaining with a few big action sequences. Yes, it’s a bit over-the-top and filled with larger-than-life action heroism (that many of us know of), but it works in certain parts and able to keep momentum, without every slowing down or need to detour with a minor unnecessary subplot. Personally, the movie sort of reminded me of a 90s action flick (i.e. more emphasis on the action nuances within the plot), which is what I think that Thurber was going for. To that end, he succeeds. Additionally, Thurber keeps the story focused on the primary objective within the narrative. Meaning that the movie never really deviates from the story it wants to tell. This, of course, makes Skyscraper a breezy feature, tightly keeping the movie on a swift runtime of 102-minute without feeling sluggish or tedious. As a whole, Skyscraper makes for a sleek blockbuster endeavor, adding a polish gleam to the feature in its technical merits. While it doesn’t have the super saturated flourishes of some of the bigger and more prominent blockbusters, the film ultimately has that “look and feel” of big-budgeted action flick. The overall ultra-sleek and technological of how The Pearl looks like is pretty awesome and make for an impressive structure (both inside and out). Thus, the visual effect for the movie should be commended as well as art direction team (Craig Humphries, Helen Jarvis, Cheryl Marion, and Grant Van Der Slagt), set decorations (William DeBiaso and Lin MacDonald), and production design (Jim Bissell). Additionally, does have some decent cinematography utilized in the movie, so credit must be given to Robert Elswit for some theatrical quality usage of camera angles and lightening. Lastly, the film’s scoring, which was composed by Steve Jablonsky, is actually pretty good, creating musical pieces that add dramatic tension throughout the movie. Definitely the movie’s background music (be soft or loud) does help the film (at least in my movie experience of watching Skyscraper). Overall, while the movie does have its problems, its technical merits are still solid for action flick. Unfortunately, despites towering / vertigo premise of big action thrills, Skyscraper fails to live up its own hype, winding up being more generic and a run-of-the-mill endeavor than being a nail-biting and memorable feature. The biggest complaint that I have with this movie is how generic and derivate the film within the genre. Thurber, who pulls double duty on the feature as both director and screenplay writer, pens the movie’s script and (to be honest) is pretty bland. A towering and impressive monolithic structure that gets taken over by bad guys makes for an entertaining setup in an action narrative foundation. Throw in a few tweaks and new ideas and a feature film could be something more than just commonplace endeavor. Unfortunately, Skyscraper doesn’t do that and keeps things thinly-written and derivates. Like I said, it’s a common traveled road for action movies (i.e. Die Hard or even The Towering Inferno) and Skyscraper just feels too cliched to discern itself from other similar movies that have been better. It’s almost like Thurber just wanted to emulate Die Hard (or any other 90s action movie) for a new generation of moviegoers, but really didn’t add that much excitement or anything new-ish to the table. Thus, it’s pretty easy to predict how the movie is gonna play out, with the same formulaic twists and turns that won’t shock or add any true dramatic consequences to the plot. It also doesn’t help the script itself is bland, with dialogue so contrite and vanilla that it almost becomes a bit laughable. Its elevated slightly by the cast (more on that below), but you can obviously tell that they are carrying the movie and not on the witty or sharp dialogue that Thurber has written for Skyscraper. Additionally, the film never really reaches its full potential on certain aspects. The most notable one is The Pearl itself. We see a few floors, including Zhao’s penthouse suite, a lavishing park, and super high-tech room (that really doesn’t amount to much in the movie beyond being a final battle setting), but Thurber never fully capitalizes on the tremendous scale and magnitude (all the stores, restaurants, and entertainment levels on the lower levels) that The Pearl has to offer, which is disappointing. Again, it seems like an interesting concept of an idea that Thruber never fully examines in the movie. There’s also a bit technobabble that seems too goofy and too stupid to even work in real life (let alone in a cinematic world) and Thurber makes Skyscraper silly (spending disbelief in several sequences) than being truly gripping. As for the actions sequences, while some are creative and a bit engaging, most of them are routine and felt generic. Nothing really new or highly creative, which (again) is disappointing. Essentially, Thurber doesn’t color outside the lines, making Skyscraper a bland and by-the-book action endeavor. Another negative point is some of the pre-release hype for Skyscraper. While I knew it wasn’t going to be grand or any type of “game change” for the action genre, but my people were citing the movie was “intensely engaging” and “inducing a sense of vertigo”. So, I was kind of expecting something a bit more than just the “run-of-the-mill” action flick. Unfortunately, Skyscraper is as generic as it comes as I didn’t find the movie to be intense nor giving me a sense of vertigo. Also, the movie has some illogical moments, including many floors of The Pearl being set on fire and blazing for several hours. Now, I’m just a movie blogger and not a structural engineer, but I would assume that raging fire (on multiple levels) of a towering building (where the bad guys block emergency safety measure from activating) would weaken the structure’s integrity and make The Pearl collapse (something like what happened to the World Trade Center buildings). Instead, most of The Pearl top half is set ablaze and the building still standing (and in one piece), which made me roll my eyes and think “oh, come on!”. The cast in Skyscraper is a mixed bag of sorts. What’s not in question is their acting talents, with most of the actors / actresses casted in the movie giving some good performances (nothing truly memorable, but decently good nonetheless). What’s in question, however, is that their character (be it development or just their involvement) is thinly-written and act more stock-like caricatures of the action genre, which does hurt the film. Naturally, at the head of the pack, Dwayne Johnson takes center stage as the film’s central protagonist character of Will Sawyer. Like many of his past and recent roles, Skyscraper utilizes Johnson’s likeability and screen presence, offering to carry the weight of the film on his shoulders. To his credit, it sort of does, making the film (from start to finish) a vehicle for Johnson to drive and operate throughout, bringing his signature style of his charming bravado, action heroics, and comedic zingers for some levity. However, the problem is that the balance of action and comedy doesn’t work, even for Johnson’s impeccable timing in his dialogue delivery. Most of these one-liner jokes can be “hit or miss”, but end up being mostly “misses”, acting like a cheap idea of pandering to the action genre of one-liners (something like Die Hard franchise). Additionally, the character development for Will Sawyer isn’t quite there, finding Thurber painting broad strokes when crafting Sawyer as cinematic character. Of course, the action genre doesn’t require a lot of intricate backstories, especially in a movie like this, but the character of Will Sawyer just comes off as generic family man / action hero that we’ve all seeing before in past endeavors. Thurber tries to add new details into the “action hero” architype with Sawyer having a amputee leg, but the idea is quickly forgot (beyond the initial moment) until later one when its used for more of nifty tool for a getting out of a hairy situation. The idea of one-legged action hero sounds cool, but Thurber never follows through with the idea as I wonder “why did Thurber make Sawyer have an amputee leg in the first place”. Still, Johnson has enough charisma to make the character work as well as he can, giving a performance that atypical for role like him and does make for a believable action hero. In larger supporting roles, actor Chin Han plays Zhao Long Ji, the billionaire savant / designer behind the creation of “The Pearl”. Han, known for his roles The Dark Knight, The Ghost in the Shell, and Marco Polo, Han’s acting talents give the character of Zhao credibility as the lofty business mogul architype. However, while character has a large part to play in the movie, the character just comes off as a half-baked one, with very little backstory and development of acting and re-acting to the film’s events throughout. Just another machination device to drive that plot forward. The same can be said for actress Neve Campbell, who plays the role of Johnson’s wife in the movie Sarah Sawyer. Campbell, known for her roles in several of the Scream movies as well as House of Cards and Party of Five, is okay in the role as the dutiful wife to Will Sawyer. Her acting talents are fine, but the character (both on her and Thurber’s parts) never really comes into her own, making Sarah a shell stock-like character of the concerned / loving wife. Plus (as a side-note), is it just me or does Campbell sort of look like Kate Mara (just a little bit). At first glance, I really thought Mara was playing Sarah Sawyer in the movie. Who knows…. maybe it’s just me. Lastly, acting as the primary antagonist for the feature is the character of terrorist mercenary Kores Botha, who is played by actor Roland Møller. Known for his roles in Atomic Blonde, The Commuter, and Northwest, Møller definitely looks and acts the part of a bad guy in an action flick, but he’s, more or less, a cliched one. There’s nothing wrong with Møller’s performance, but the character is too thinly-sketched to even care about the villainy he’s doing. Basically, the character of Kores Botha is a flat footnote baddie and nothing more. The rest of the supporting character in the movie, including actor Pablo Schreiber (13 Hours and Orange is the New Black) as Sawyer’s former FBI teammate Ben, actor Noah Taylor (Edge of Tomorrow and Game of Thrones) as Mr. Pierce (an associate to Zhang Long Ji), actor Adrian Holmes (The Collector and Elysium) Ajani Okeke (another associate of Zhang), actress Elfina Luk (Lucifer and Love Happens) as Police Sergeant Han, actor Byron Mann (Hell on Wheels and The Big Short) as Inspector Wu, actress Hannah Quinlivan (The Shanghai Job and Moon River) as Botha’s terrorist lackey Xia (looking like an Asian Ruby Rose in the movie), actor Matt O’Leary (Live Free or Die Hard and Death Sentence) as Botha’s lackey named “Skinny Hacker” (really…. they couldn’t come up with a generic first name for the character), and young actors Noah Cottrell (Two to Go) and McKenna Roberts (The Young and the Restless and Extant) as Sawyer’s two kids Henry and Georgia Sawyer, are mostly stock-like characters that serve as pieces to the larger story being told. All the acting is fine and some do get more prominent screen-time than others, but these characters are merely window dressing for the feature and nothing more. Will Sawyer scales the world’s largest building to save his family and unravels a heist takeover plot from within in the movie Skyscraper. 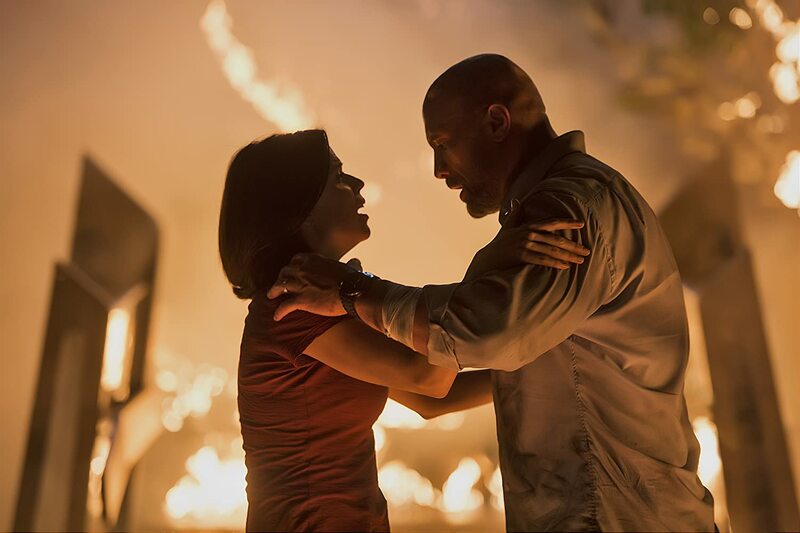 Director Rawson Marshall Thruber’s latest film sees the classic action “hero” scenario play out, utilizing blockbuster thrills and CG spectacle in order to engage viewers into its cinematic story of heroics and deaf defying sequences. While Johnson’s magnetic screen presence keeps the feature afloat as well as some fun B-rated action nuances throughout the several key points in the movie, the film can’t find its own rhythm, treading down a familiar path of cliched action tropes, bland storytelling, thinly-sketched characters, and (to simply put it) never reaches its own potential to be memorable or unique. To me, the movie was somewhere to okay and “meh”. I mean, it did have certain action parts that were cool (definitely a semi-guilty pleasure experience for me) and Johnson was great in the movie, but the film never fully materializes on its own and ultimately gives off a half-baked run of ideas and scenarios. That being said, I think that this movie was better than Rampage (Johnson’s other 2018 movie, but only slightly. Thus, I would probably give this movie an “iffy-choice” as the likeability of this movie draws an ambiguous line (i.e. some will like it, while other won’t). In the end, Skyscraper is just another “larger-than-life” (if not generic) movie endeavor made by recent Hollywood, capitalizing Johnson’s likeable charm in an otherwise mindless popcorn feature. There is something about the corniness of the trailers that has me ready to see this. I can’t explain it. I know movies like this are never in the realm of greatness. But I do get a kick out of them…some of them. Saw this a week ago….must have been on the day it was released here. So I played which film did they take this from bingo with it. It was enjoyable enough – if you parked the expectations at the door. My child (all of 11) thought it was cool…. Well, at least you enjoyed more than I did. It was so generic and derivate that I hardly found it entertaining (beyond Johnson’s performance). Definitely agree with you. There’s a fine line between over-the-top fun and generic and Skyscraper chose the more generic path to follow.